FCstore, a responsive Prestashop theme built with Bootstrap 3 and the latest version of Prestashop. Its exquisite design certainly serves as a real high-power seller with stunning features. 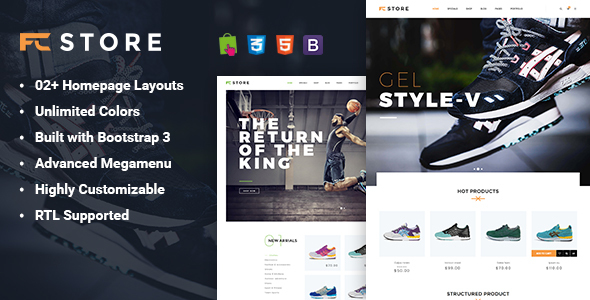 Fcstore comes with 5 beautiful homepage layouts and 5 color styles. It is not only an elegant theme, but also is a powerful theme with cool features: Responsive layout, RTL language, powerful Mega Menu, flexible Boxed layout, dynamic Ajax Attributes Filter, product List and Grid view, Product Quick view and Product Image Zoom, Bootstrap 3, Font Awesome 4, CSS3, HTML5 and many other features which help you to build an eCommerce website just in few minutes. FCstore is suitable for any users from users with no coding knowledge to developers. Find out more powerful features in FCstore now!